The Ongoing Crisis In Europe: Will The Euro Survive? In some ways the biggest problem with the European Economic Community (EEC) is the common currency known as the Euro. Although it is a global medium of exchange and presides over the largest economic zone in the world, there have been ongoing difficulties since its adoption in 1999. Only 19 out of 28 members of the EEC have adopted the Euro as their national currency. There are some analysts who consider that there might be too many countries in the Euro-zone. The trouble is not the number of nations, but rather the diversity in culture among them, when it comes to financial and fiscal affairs. The widespread circulation of the Euro did not arrive until 2002. Before then, there was some difficulty in valuation of the new currency. It was anticipated early on, that the Euro would trade above parity in relation to USD (United States Dollar). The outcome was quite different. Although on the first day of trading on January 05th 1999, the Euro climbed to a valuation of $1.19 USD, by the end of the year it was at parity. Further along, the Euro then dropped to an inter-day low of $0.8296 USD on October 26, 2001 and there was even a brief crash that arrived on January 15, 2002. On that date, the Euro dipped to a reduced rate of $0.8115 USD. The G-7 (the 7 leading advanced economies of the world) then called for emergency action by the end of 2001 to support the Euro, since the plunging value was causing a disruption in world financial markets. A turnaround finally did indeed, arrive. The last time the Euro closed below $1.00 USD was on November 06, 2002. After that adjustment period, the Euro continued to appreciate. By 2004, the valuation had reached $1.35 USD. 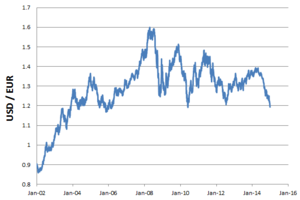 The peak came on July 14, 2008 when it hit a high of $1.5916 USD. 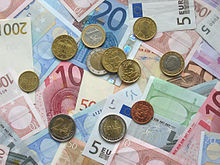 As the Euro increased in value against the pound sterling (the national currency of the United Kingdom), the international usage of the Euro increased dramatically. The global share of foreign exchange reserves for the Euro increased from 18% in 1999 to 25% by 2003. The American dollar fell by an equivalent margin. By 2007, there were many monetary experts predicting that the Euro would soon overtake the United States dollar, as the foremost currency in the world. The Euro became a reserve currency on its inception, because it inherited that role from the German Mark, which held 13.8% of the total of global foreign exchanges in 1998. The United States dollar had 69.3% of the total in comparison. The following year the new Euro captured 17.9% of the world market and the USD increased to 71% of the total. By 2009, the Euro had grown to acquire 27.6% of the holdings of foreign exchange globally. The United States had an approximate corresponding drop to 62.1%. By 2014, the share of the United States had remained essentially the same at 62.9%, but the Euro had dropped to 22.2%. The Euro still remains the second most common held currency despite the recent decline in valuation, which has accelerated with the advent of below zero interest rates and a third round of quantitative easing. 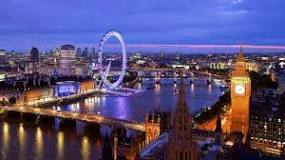 In contrast, the British pound sterling has enjoyed a slight resurgence given the role of London in international finance and the function of the currency as a proxy to the Euro. However, even though the pound is the fourth largest world reserve currency, it only comprises 3.8% of the total. The Japanese yen is only slightly larger at 4%. The original nations that comprised the common currency area of the Euro were Austria, Belgium, Finland, France, Germany, Ireland, Italy, Luxembourg, the Netherlands, Portugal, and Spain. Further enlargement would arrive first with Greece in 2001 and the country of Slovenia in 2007. In 2008, both Cyprus and Malta would join, followed by Slovakia in 2009. Later the Baltic nations would be admitted. 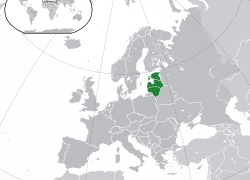 First Estonia in 2011, then Latvia in 2014 and finally Lithuania in 2015. 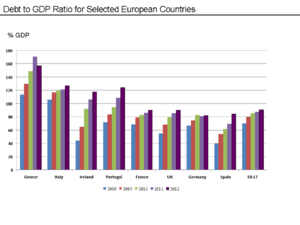 Public Debt To GDP Ratio For Selected Eurozone Countries And The UK—2008 To 2011. As late as 2007, former United States Federal Reserve Chairman Allan Greenspan stated that the Euro could replace the USD, as the world’s primary reserve currency. To be fair two events intervened between then and now. The expansion of the Euro with the EEC has slowed, the decision of the United Kingdom to keep the pound being the most noteworthy. The second factor has been that the depreciation of the United States dollar has been reversed, at least temporarily. The present turmoil in world currency markets, makes USD the most attractive currency for the widest number of international investors and national central banks. The linchpin of the Eurozone is Germany. It was the strength of the German Mark that made the common currency of Europe possible. Few will now recall that the Germans were very reluctant to give up the stable currency, that had been so much a part of the economic miracle that occurred after World War II. 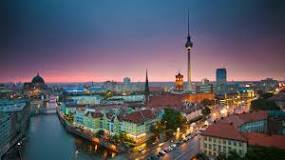 The critical time came when the possibility for reunification of Germany had arrived following the collapse of the Soviet order in Eastern Europe. Both France and the United Kingdom opposed the merging of East Germany into West Germany. These two nations separately attempted to influence the Soviet Union to prevent it. There was some trepidation of an even stronger Germany in central Europe. However, the French finally decided to support reunification, if the Germans would commit to a monetary union. As a result of the global financial crisis of 2007/2008, the Euro-zone entered into recession starting in the third quarter 2008, and would remain in this state until the second quarter of 2009. As the EEC as a whole began to return to growth, another problem now moved to the forefront. This was the sovereign debt crisis. During this period it was decided to strengthen rules within the Euro-zone, that culminated in 2011 with reforms in the European Stability Mechanism (ESM). A new reform of the Stability and Growth Pact that same year, was aimed at codifying the rules and penalties by automatic procedures. These would come into play, whenever an individual nation failed to follow the new rules on budget deficits and sovereign debt levels. According to the fiscal rules agreed upon by the member states, government deficits would not exceed 3% of GDP (Gross Domestic Product) in any given year. Sovereign debt was not to exceed 60% of GDP. If the total debt level would end up exceeding the imposed limit, the offending nation would be required to implement a plan to bring it back below the benchmark. As outlined by the preventive regulation part of the agreement, all member EU states are annually obligated to submit a compliance report to this effect. Although there is some flexibility to these two main requirements during times of recession and slow growth, it has become increasingly difficult for member nations to accede to the fiscal constraints. In recent times Germany alone, among the major countries has been able to keep spending below the prescribed levels. There is an ever greater proportion of national politicians in countries across the Eurozone, who are questioning the benefits of being part of and remaining in the common currency zone. The discourse in a growing number of nations is whether the spending constraints and the present austerity, is worth the price of remaining in the Eurozone. Europe as a whole, has a ratio of 91.9% debt to GDP. The Eurozone exclusively is now at 93.91%. Far exceeding the agreed upon rate. As recent as 2010 this level was 80%. In 2008 it was as low as 66.2%. Individually almost all the countries in the Euro-zone have sovereign debt levels, that far exceed agreed upon levels. France is at 95% at the end of 2014. Spain posts a rate of 97.70%, with the Netherlands at the more reasonable total of 68.80%. Even the frugal Germans come in at 72.99%. Italy posted a whopping 132.32%, with the debt ridden Greeks at 174.1%. The United Kingdom part of the EEC, but not the common currency area saw a debt level of 88.91% in 2015. Independent minded Switzerland which has remained outside the EEC, registered a far lower rate of 34.20% in 2014. The Nordic nations and Eastern Europe are the only nations that have acceded to the rules in the accumulation of debt. To the north in 2015, Denmark maintains a rate of 42.42% in debt to GDP ratio and Sweden come in at 44.03%. 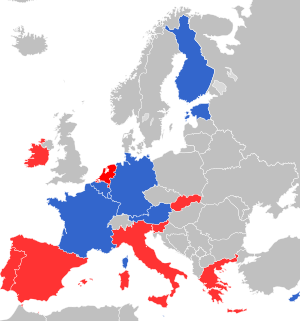 Both of these nations are part of the EEC, but not part of the Eurozone. Finland is just above the limit at 60.97%. In the east, Bulgaria boasts the rate of 28.74%, the Czech Republic at 41.71%, Poland at 50.97%, and Romania at 39.97%. These nations are also part of the EEC, but not the common currency zone. The two other smaller nations in the region can also advertise rates well below 60%. They are Slovakia and Slovenia. The Baltic nations to the northeast exhibit the most responsible management of debt to GDP. Estonia is only at 10.60%, Latvia at 38.33%, and Lithuania at 42.82%. However, the relative small size of these nations have a much smaller impact on the EEC and the Euro area on the whole. More progress has been made in the annual budget process, where the Germans are continuing to insist that member nations follow the rules as the only way to manage long term sovereign debt. 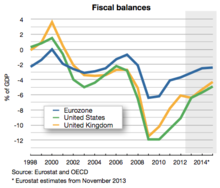 The EEC as a whole maintains an annual deficit of -2.24% which does stay below the 3% rate. The nations that will exceed this rate in 2015 are Croatia, Cyprus, Finland, France, Ireland, Portugal, Slovenia and Spain. The United Kingdom with its own currency is still running a deficit of -4.11%. Three countries will actually generate a small surplus in 2015. These are the nations of Estonia, Luxembourg, and most importantly Germany at +0.49%. 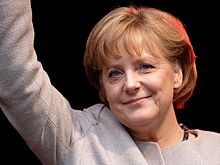 The financial leadership of Germany refuses to adhere to the pleas of some other European nations and the Obama Administration in the United States, that insist if Germany ran deficits it would help growth domestically and elsewhere. Although increased expenditures there would stimulate the economy in the short run, long term growth where rising debt is increasingly an issue suffers. This has been the determination of German economic planners in Frankfurt (the financial capital of Germany and the Eurozone). The Euro has now dropped to $1.10 in valuation in relation to the American dollar. This has resulted in some advantages, that go along with the recent depreciation in the common currency. European exports especially those from Germany for example, have become far more competitive in world markets. Germany remains the second largest exporter in the world and is expanding its lead over other contenders. This sector alone, contributes to one third of the German economy. The all time high in total value of German exports was reached in March of this year at 107,652.08 billion Euros, the equivalent of $118,594.91 billion USD. The total value of imports were valued at the far lower amount of 84.5 billion Euros. German foreign exchange reserves as a result are rising rapidly. This is what German economists and political leaders remain focused on. For a number of years the Eurozone in the trade arena worked relatively well, with Germany selling products in Mediterranean Europe at a rapid pace. The countries in the region continued to purchase German goods beyond what was affordable, once their economies were no longer growing. 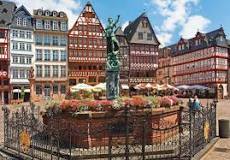 The Germans through loans from commercial banks, the ECB (European Central Bank) and other European institutions kept this trade going. The problem came when the debt level rose beyond, what could be prudently financed. The countries in Mediterranean Europe and and a few nations elsewhere in the Eurozone, were eventually forced into austerity. This was because as a group they continued to spend money on entitlements and other social spending that in an era of lower growth, was simply not sustainable. The running of large budget deficits and the aforementioned trade deficits, pushed these countries to borrow larger and larger amounts of money. As the total debt level rose ever higher, default and possible bankruptcy became a strong possibility. That is when these nations began to receive additional loans, but now there were more strings attached. These countries would be forced to become more competitive, through economic reforms and far greater fiscal restraint. This policy would soon come to be known throughout Europe as austerity. It was the plan of action that the Germans insisted on, if the loans were to continue to be provided. That the benefits of being part of a larger currency zone continue to outweigh the negatives, is crucial in keeping Germany in the Euro. The viability of the Euro will not be decided in Athens, Rome or Madrid, which forms the outside periphery of the Eurozone. It will not be determined in Paris or even Brussels, the de facto political capital of the European Union. The eventual fate of the Euro lies in the hands of the bankers in Frankfurt and the politicians in the German capital of Berlin.